As much as we love our feline friends, there is always one aspect of their being that every cat owner will admit isn’t the greatest- cleaning up litter. It’s fiddly, frustrating and it gets pretty much everywhere- unless you have a cat litter mat. Cat litter mats are amazing, simple pieces of soft furniture that can capture the dust and debris that comes with cat litter- no matter which type of litter is your preference. They help cut down on cleaning time and keep your house much more hygienic, overall. This is why we’ve scoured the internet to find you the best cat litter mats on the market, today and you’ll even find the best maintenance tips and tricks for caring for your kitty litter mat, below. Feel free to read everything you need to know about cat litter mats and check out our favorites to help cut down on tracking, in your house. A tough, durable, yet surprisingly soft litter mat, this premium litter mat from Gorilla Grip has a non-slip rubber backing to keep your litter mat nice and secure as your kitty goes about their business. Meanwhile, the sturdy mesh and deep grooves allow for any and all dirt from your cat’s litter tray to be captured before it’s tracked around the house. Despite its tough design, you’ll be pleased to know that the Gorilla Grip cat litter mat is surprisingly easy to clean, although not fully suitable for machine washing do to its majority-plastic material. Simply shake down, outside and then vacuum any leftovers and hand wash the rest, if needed- just be sure to do it away from your kitchen sink, for hygiene reasons. Available in an aesthetically pleasing design that would look great in any kitchen, bathroom or hallway, the large cat litter mat from Easyology comes in multiple colors to suit any interior design. The extra-large, PVC mat is said to trap up to 37% more than its competitors, possibly to its compatibility with all types of cat litter, including crystal, wood and regular- clumping or non-clumping. 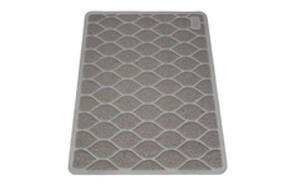 This is one of the most popular litter mats online, with nearly 7,000 positive reviews, customers love having this heavy-duty cat mat thanks to how well the Easyology mat cleans up and holds its own- even against use by multiple cats! The tight weave of the BPA and phthalate-free plastic even ensures that long-clawed kitties don’t get their nails stuck- another big positive to this great-looking mat. The Blackhole cat litter mat has become somewhat synonymous with quality as one of the best-rated and highest-quality cat mats on the market, today. 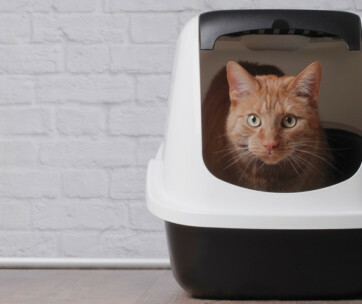 Designed with two layers- the rounded top layer, which has been created to capture the litter dust that falls from your cat, and the second to trap the dirt and debris, with a view to make it easier to clean up the rubbish that comes away. Once a week or less, depending on the how often the litter tray is used, simply open up the mat and shake away all the litter that has been captured. The EVA foam is also super easy to clean with water and soap- just be sure to air dry the mat to keep the durability and shape. If your cat isn’t keen on walking across mesh surfaces when using the litter tray, the ToughGrip litter mat from PetFusion is a great alternative. Made from a high-grade silicone, this is a completely waterproof alternative that makes it the perfect choice for older cats who might be struggling with their aim. The elevated ridges encourage movement between the pads of your cat’s paws, allowing any trapped litter to release onto the mat before your cat moves on. 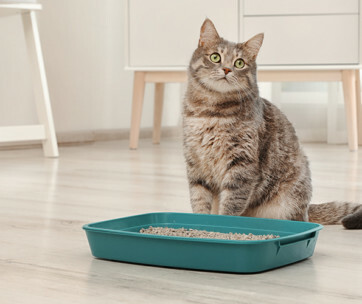 The silicone cat litter tray mat is also very easy to clean, since you simply need to shake off the excess dust and wipe down the surface, to return to a clean, hygienic litter mat. With an emphasis on high resistance to claws and the ability to shake, twist and beat this heavy-duty litter mat, the Might Monkey litter trapping mat comes with a ten-year guarantee that truly showcases the dedication to longevity by this company. With slip-resistant backing and a mesh surface that is both comfortable for your cat and great at catching litter, the litter trapper is made with phthalate-free and ideal for cats with sensitive paws. To clean, simply shake off the dirt and dust, followed by a vigorous wipe-down with soap and water. If you’re in a rush, of course, you can simply vac away without worrying about the mat moving as you clean, thanks to the rubberized backing. Our second choice from Easyology, this is the biggest cat liter mat on our top picks and designed to handle multiple litter trays- perfect for multi-pet households. Again, this comes in multiple colors with a simple, yet lovely design that gives a certain sense of class to your home- despite the rather humble job the mat is designed for. The PVC material is phthalate and BPA-free, yet is still soft and comfortable on kitty claws, as well as remaining easy to vac and clean (although still not machine washable).The litter-catching design snaps up any loose dirt but easily gives way to the average household vacuum- which, considering it’s super large size, is a huge benefit if you’re not keen on rolling and picking up the mat every time you want to clean it. Another large choice of litter mat with a dual-layered design to capture litter with ease, yet releases the dirt just as quickly. The honeycomb style top layer has been created to open up pads gently, to encourage movement and grab loose litter that your cat would otherwise track around the home. Meanwhile, the second layer uses a plastic top to keep the mat waterproof and can easily come away from the top half, if you need to use a puppy pad or similar between the two materials. This is perfect for cats who are prone to accidents or have poor aim, since the pad can easily be removed once used, and the plastic film repels odors and slip-ups. Once you feel enough dirt has been caught, simply pick up the mat and open up the different layers to set the dust and debris free! 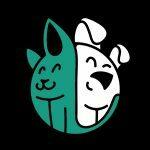 Another rubber option that is completely waterproof and super easy to clean, without using a washing machine is the Purr-FECT paws cat litter mat from Petlinks. This choice holds a patent-pending design to encourage the release of litter that can become caught between paws and stop litter being tracked around the house. Available in three sizes, this mat is super-flexible, which makes it really easy to roll up and take away when it’s time to clean. It’s also the cheapest option on our list, which makes it a great budget buy. Unfortunately, however, we couldn’t see any info on whether this is phthalate-free, so it might be worth checking out if you think your cat will be using their litter tray a lot. If not, for example with outdoor cats, this is still a great option for occasional use. 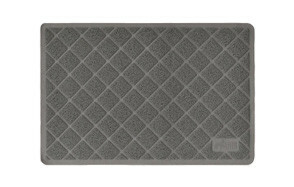 The cute design of this premium cat litter mat from CleanHouse Pets does well to hide how effective this mat truly is. Another hand-wash-only option with an eco-friendly BPA and phthalate-free mesh, this mat comes with a lifetime warranty. So, if you’re not happy or there’s a manufacturing issue with your mat, get in contact with CleanHouse to get a replacement of refund- this even works in conjunction with their lifetime warranty, making this a great long-term option! Made from an eco-friendly EVA foam, this cat litter mat is able to be machine washed in a pinch, although it is advised to hand-wash only, which makes this one of the easiest litter mats to clean. Of course, it helps that this is a quality, affordable option with a dual-layered design, with the purpose of capturing any excess litter from your cats’ paws and being easy to shake out the dirt and debris during cleaning. While not a great option if you prefer pellets, which are too large for the holes in this litter mat, this is still a popular option thanks to the fact that cats seem to have no issues with the material- making them more likely to walk over it when they’re finished with their tray and therefore cutting down on tracking, considerably. While it would be nice to be able to buy any old mat and chuck that under your cat litter box, we all know that it’s unlikely you’ll find a great cat litter mat this way. There are hundreds of options out there and, sometimes, even our top picks might not be right for your house. Check out some of the considerations to take into account when buying litter mat for cats, below, and decide on what works best for you. 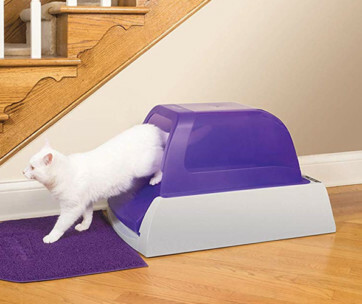 A litter box mat will only work if you have the right size around the litter box area. The best way to manage this, is to have a litter box that only has one direction for entry and exit, such as a covered cat litter tray. Otherwise, you’ll need to spend a little more money getting a litter tray that covers a larger area, so that your cat doesn’t simply jump over the mat, when exiting their tray. The surface needs to be soft enough that your cat’s sensitive paws don’t try to avoid the area. The softer the mat, the more likely your cat is to step on the litter mat and clean their paws. If the surface is too rough, they will likely try to avoid their new kitty litter mat at all costs. This contributes to the overall feel of the mat which, as we now know, is an important factor in whether or not your cat will use their new litter mat. However, this isn’t the only reason why material matters; having the right material can make dislodging dirt and debris from between your cat’s paws much easier. There isn’t much point investing in a high-quality cat litter box mat if you then can’t clean the mat itself. The best cat litter mats are machine washable, easy to pick up and easy to vacuum or flick out dirt and general mess from the surface. Common features in cat litter mat revolve around cleanliness- with many boasting about their antibacterial qualities and added ways in which the mat can capture litter dust. As always, when it comes to features, these are nice to have but not essential to the overall capability of the item. Remember that these added features usually bring the cost up a little- but they can also cut down on everything from drying time, once washed, to holding certain scents to increase a kitten’s interest in their litter tray. A good kitty litter mat won’t fade or break apart through continuous washing and general wear and tear. They should be able to withstand the test of time- otherwise, you may end up spending more over time than you would with a higher quality mat. The best way to check the quality of the mat is to look at the reviews of other users. We always check the recommendations of other users before adding them to our top picks, which is one of the reasons why we love them so much! 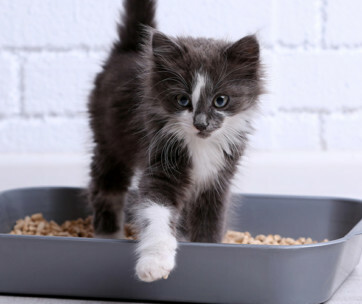 Frustratingly, cat litter has a tendency to get caught between the claws and pads of cats as they use their litter tray. If this doesn’t come away within the first few minutes of leaving the litter tray, it’s likely that they’ll end up with not-so-hygienic dirt caught between their claws and paws. This can be, at the very least, annoying for your cat. At it’s worst, these particles can make your cats paws sore and lead to an infection. Having a cat litter box mat means there’s a great chance of this debris being dislodged from your cat’s paws before they become embedded. As above, dust and debris from your chosen litter is likely to get stuck between your cats’ pads. These particles then leave the tray area with your cat and end up all over your nice clean carpet and/or flooring- something commonly referred to as “tracking”. While this isn’t the fault of your feline friend, it can still be very annoying- especially if you find yourself cleaning up after them multiple times a day. So, investing in a litter box mat means you can cut down on cleaning time throughout the day, giving you greater peace of mind and a chance to relax. Cat feces contains some not-very-nice bacteria, such as E. Coli and can therefore be very dangerous to your family- especially children under 5. If your cat is tracking litter around the house, chances are he or she is also bringing along some of those delightful particles, too. Having a cat litter mat can help stop the spread of these bacteria, meaning your house will not only look cleaner on the surface, but be hygienic to the core, too. Just be sure to clean your cat litter mat, as well. 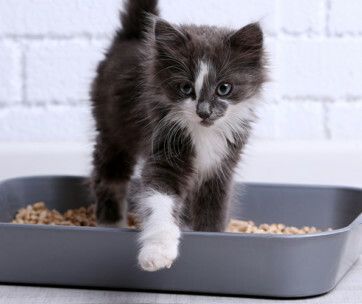 Naturally, your kitty litter mat will need to be cleaned regularly to ensure the best hygiene. Always check if your cat litter mat is machine washable- as this will make your job much easier. Shake off the mat from time-to-time to get rid of all the dust and dirt that gathers through use- the number of times you’ll need to do this depends on how frequently your cat uses their litter tray. Once you’ve given the mat a shake, give your litter mat a vacuum to ensure that as much dust as possible comes away from the fibers- this will help to save your washing machine in the long-term. Finally, pop the mat in the washing machine, paying attention to the best ways to wash your mat according the manufacturer’s guidelines, and allow the mat to air dry where possible. This can take a little time if your cat’s litter mat is heavily soiled, so it may be wise to buy two mats and circulate them for maximum efficiency. Q: What is the purpose of the holes in the litter mat? 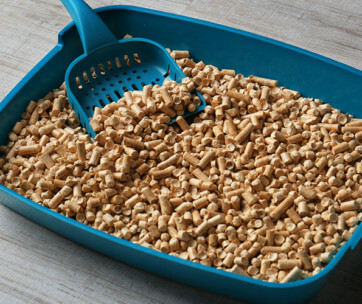 A: One of the most popular cat litter trays to have this feature is Blackhole cat litter mats, so we asked them for the reasons why they introduced holes. They told us that these were created simply to capture and trap any excess litter dust from your tray or cat’s paws. This stops the dust and dirt from scattering and gives the debris a chance to fall from between the pads of your cat’s paws, into the bottom layer of the mat, below. Q: Is a cat litter mat safe for my cat? A: In order to ensure that your cat litter box mat is safe for cats, you need to check whether or not they are non-toxic. Toxic products for cats include BPA and phthalate (pronounced “thalate”), so you might notice that our top picks make a point of mentioning the lack of these materials in their descriptions. Used in common plastics, BPA is known for possibly leaving tiny particles, which can be ingested over time- they are currently banned from all baby products as the results of digesting BPA are currently unknown. Similarly, phthalate is used to soften items and make plastics more malleable and harder to break. Studies have shown that phthalates can cause reproductive issues in animals, as well as respiratory paralysis. Thus, it is very important that any items purchased for your cat need to be both BPA and phthalate-free. Q: How do I shake off the sand that accumulates on it? A: This depends on the type of cat litter tray mat that you have purchased- some made be made up of multiple layers, which you will need to open up or separate in order to free the litter dust that has made its way into the mat. For others, it can simply be a case of holding up the litter tray mat and forcefully flicking the sand off, or laying it over a washing line and using a stick on the floor-facing side to gently beat away excess dust that has accumulated on the litter mat. Q: Is cat litter mat immune to cat scratching? A: When it comes to cats, nothing is entirely immune to their scratching! Of course, the desire to scratch by your cat can be lessened through the use of the right material. For example, a softer mat is less likely to be scratched by your cat as it won’t have the desired effect of catching your cat’s claws, which would therefore be of little interest to them. 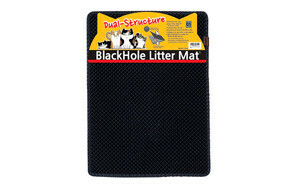 You can also buy mats that are designed to handle both their ability to catch litter and double-up as a scratching mat. While not ideal, this certainly goes with the phrase “if you can’t beat them- join them”! Q: How should I place my cat litter mat? A: Ideally, a cat litter tray mat should be placed at the only entrance and exit of the litter tray. However, we know that not all trays are made this way. If this is the case, you’ll need a litter tray mat that is big enough to fit all the way around the tray itself, else the mat may simply be jumped over and lead to the dirt and dust being tracked around the house, regardless. In these situations, you’ll need a litter mat that stands between 6-10 inches beyond the reach of the tray itself, all the way around the litter area. This is the best way to ensure that the dust from the litter is caught as your cat steps over the area. The Gorilla Grip Original Premium Durable Cat Litter Mat came up as our top pick thanks to its cleanliness, overall ability to capture litter and great size. Loved by over 2,500 users who speak highly of how well this cat mat works for picking up litter and keeping their kitty happy- as well as how well it cleans-up, with its non-slip backing that makes sure your new mat stays put as you dust, scrub or vac the dust up left by your cat. Available at a great price, this litter tray mat can keep your cat happy, with many cats deciding that this also doubles up a great place to nap- so it definitely hits the comfort factor. It’s also big enough to ensure that your cat will definitely be able to shift the dirt from their paws as they leave their tray- which, in turn, leaves your floors clean and hygienic!